“President Jonathan assures Dr. Mimiko that the Federal Government will continue to engage constructively and positively with the Ondo State Government in collaborative efforts to achieve faster socio-economic development and better living conditions for people in the state and all other parts of Nigeria,” the statement added. The statement said President Jonathan wishes Mr Mimiko ‘a very successful second term as Governor of Ondo State’. The Returning Officer, Adebiyi Daramola had declared Mr Mimiko the winner of the Ondo election having polled the most number of votes. Mr Mimiko of the Labour Party had polled a total of 260, 199 votes. 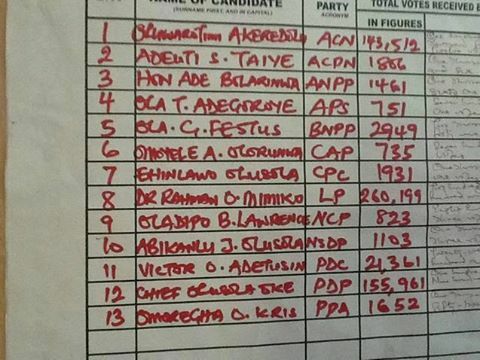 The PDP placed second with 155, 512 while ACN came third with 143, 512 votes. PreviousPrevious post:Governors, Private Jets and Public AccountabilityNextNext post:Why Are Public Officials Afraid of the Social Media?